Italian scholar and Talmudist; born at Urbino Nov. 30, 1566; died in 1641. At the age of thirteen Moses became the pupil of Jedidiah of Rimini: the date of his birth and the date of the engagement of Jedidiah as his teacher (Nov. 8, 1579) appear at the head of one of his manuscripts. No. 2317 in Neubauer's "Cat. Bodl. Hebr. MSS." comprises the following works by him: observations and decisions on the treatise Ḥullin; notes on Alfasi to Pesaḥim; notes on the haggadot of the Talmud collected in the "'En Ya'aḳob"; observations on various sayings of Isaac Arama. 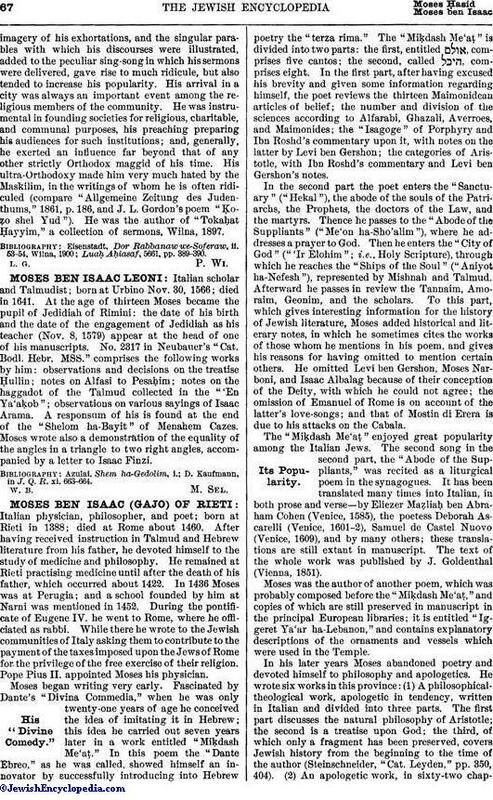 A responsum of his is found at the end of the "Shelom ha-Bayit" of Menahem Cazes. Moses wrote also a demonstration of the equality of the angles in a triangle to two right angles, accompanied by a letter to Isaac Finzi. D. Kaufmann, in J. Q. R. xi. 663-664.